I published more than 50 Quirky Berkeley posts in 2016. That’s a lot! 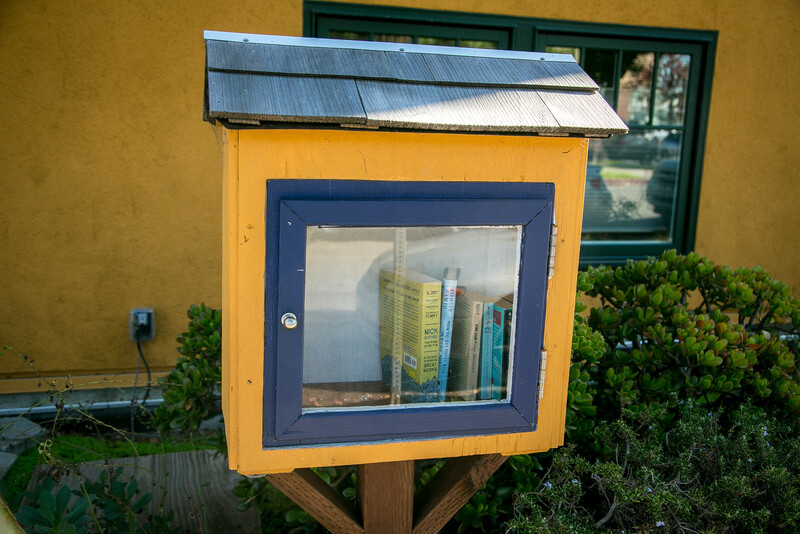 Here I subjectively choose some of the most popular Quirky Berkeley Posts of the year. A review of 2016 has to begin with publication by Heyday Press in the summer of Quirky Berkeley, the book. 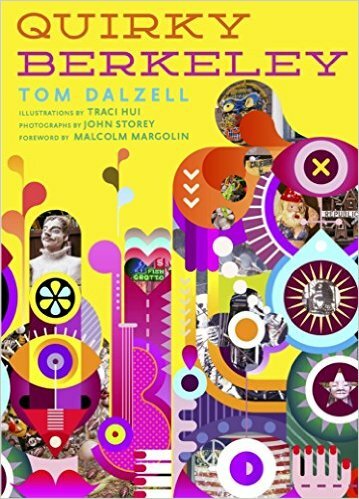 I have talked with hundreds of people about the book and about Quirky Berkeley. Big fun! For me, 2016 was a year in which Quirky Berkeley took on a new feel. It started to feel like something that was here before me and will be here after me. It started to feel like I had not much to say about where it was going – it was going and I could follow or not. 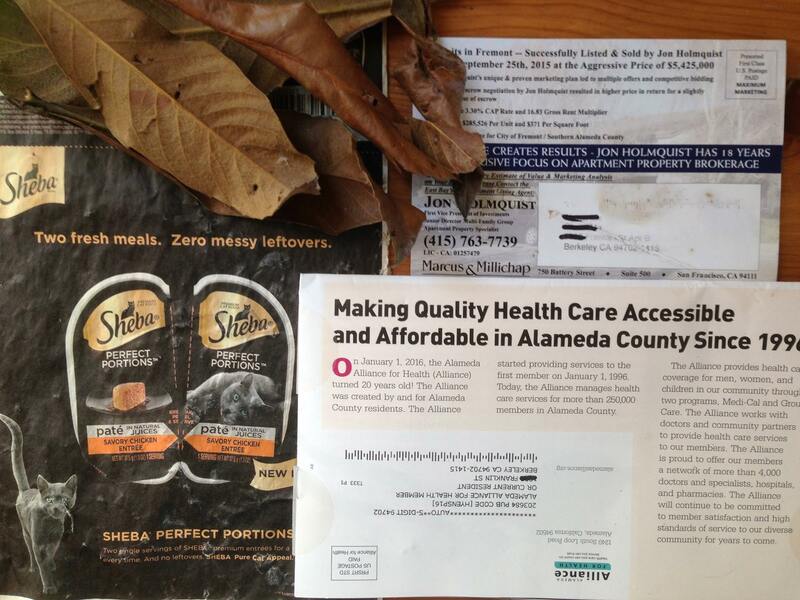 The number of coincidences emanating from Quirky Berkeley became too large to ignore. I couldn’t but help to feel like the trajectory had been chosen for me, not by me. My first post of 2016 broke the rules, all the rules. 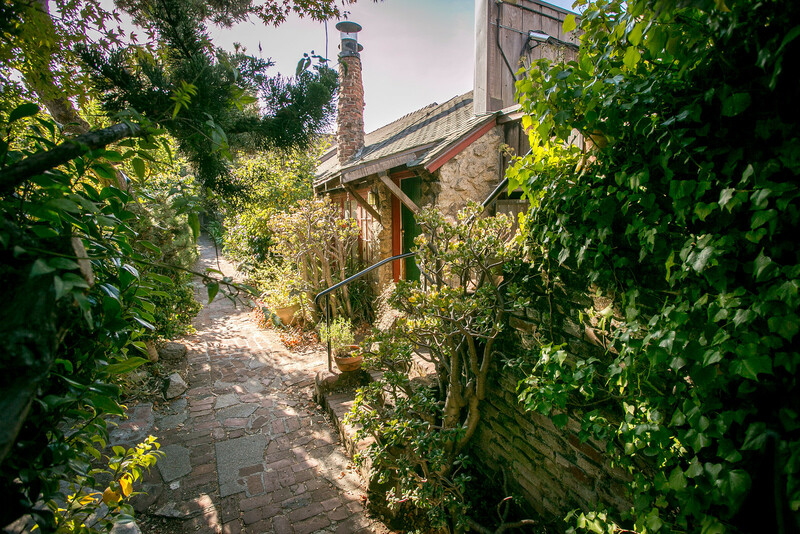 I abandoned the Quirky Berkeley mission of showing quirky material culture visible from the street, path, or alley. I went inside houses. And not just in Berkeley. I showed you the quirkiest bathrooms I had come across, here and elsewhere. It’s a great post, even if it breaks the rules. 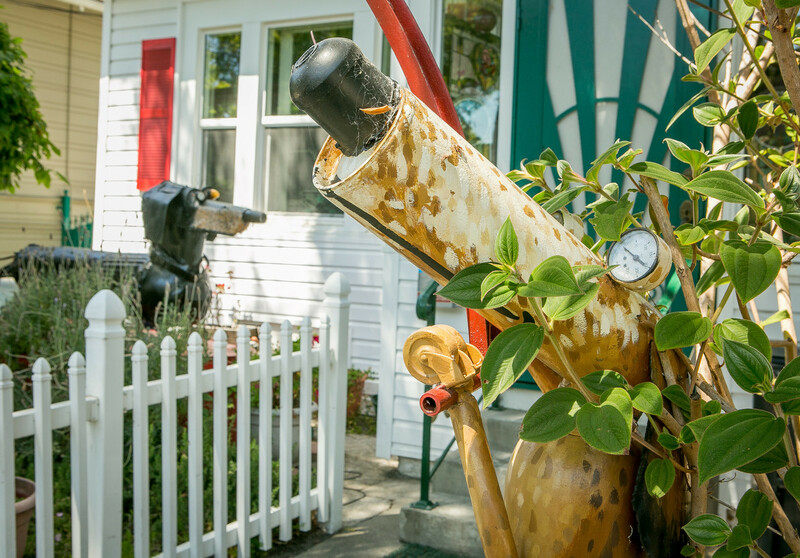 In my post on 2233 McKinley, I focused on that which is visible from the street – an impressive collection of quirky material culture assembled by Howie Gordon. Having followed the rules, I cheated. I went inside. 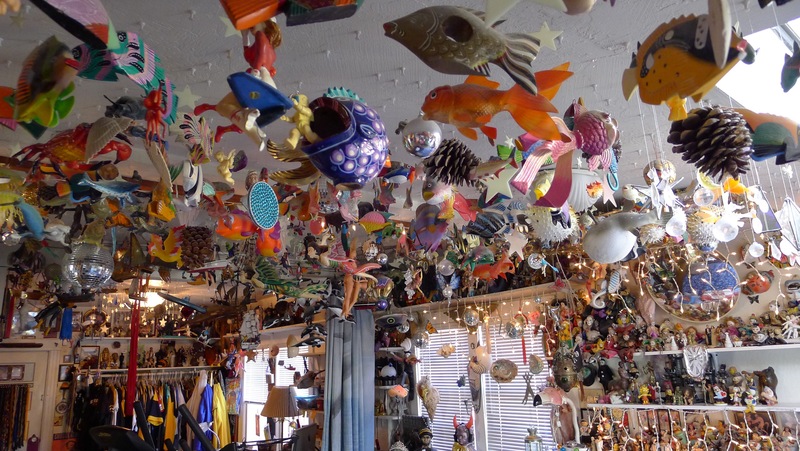 And photographed two rooms filled with thousands of small quirky objects – on shelves, hanging from the ceiling – everywhere. I will mention here that I made rule-breaking posts on several GREAT collections inside homes, including Will Squier’s sufficiently strange kitsch, Leonard Pitt’s structures and ephemera from Paris and Detroit, Art Ratner’s miniature souvenir buildings, Ken Stein’s souvenir Berkeley spoons and his collection of Berkeley political buttons, and Jon Balderston’s collection of toys and vintage packages. 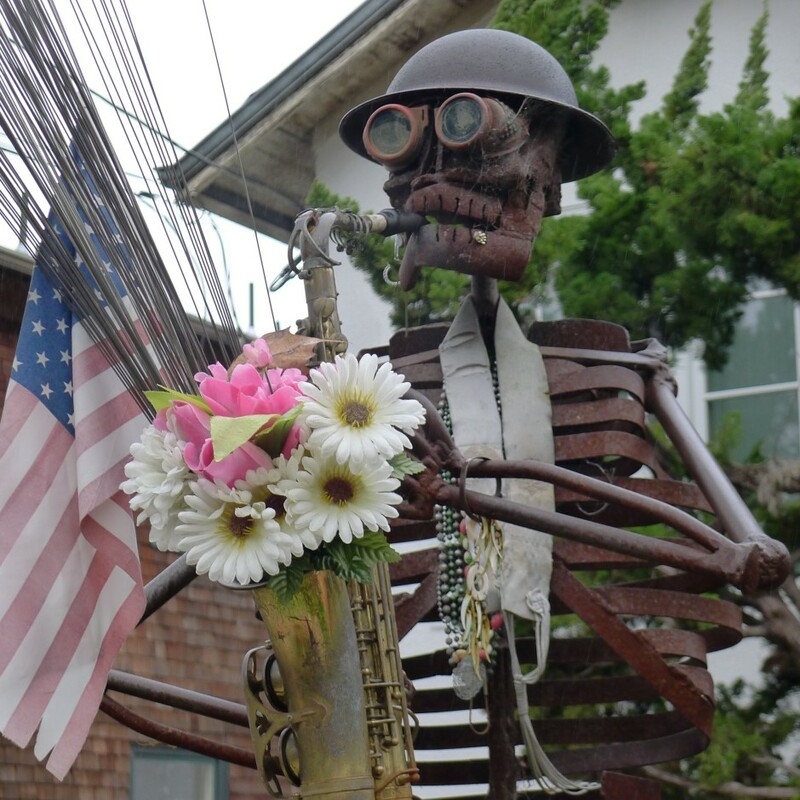 We have all seen the rusty skeleton playing a sax on Marin. Here I tell the story of the skeleton, of Mike Nagamoto who made the skeleton, and the other pieces of his steel art. Speaking of steel and rust, I continued positing about Mark Bulwinkle and his work, which I find to be as quirky as quirky gets. 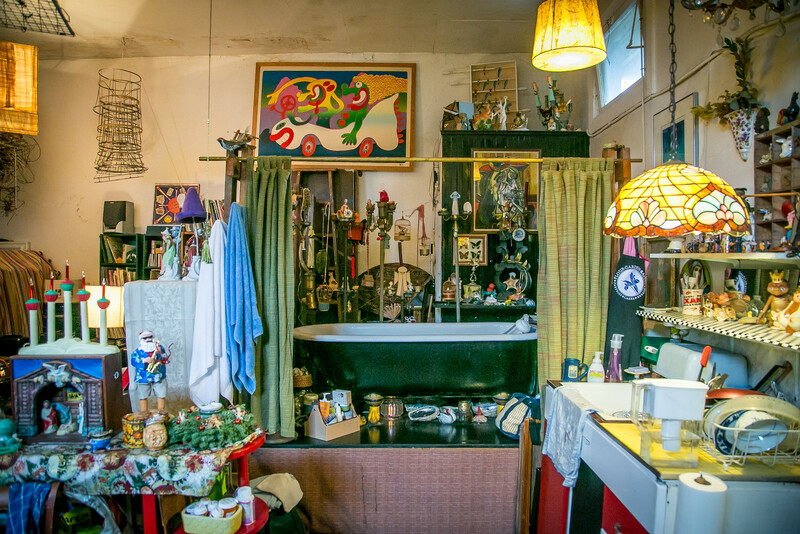 I posted on his painted walls, his tiles, and his metal work at the Mad Monk Anachronistic Media Center – old Cody’s. 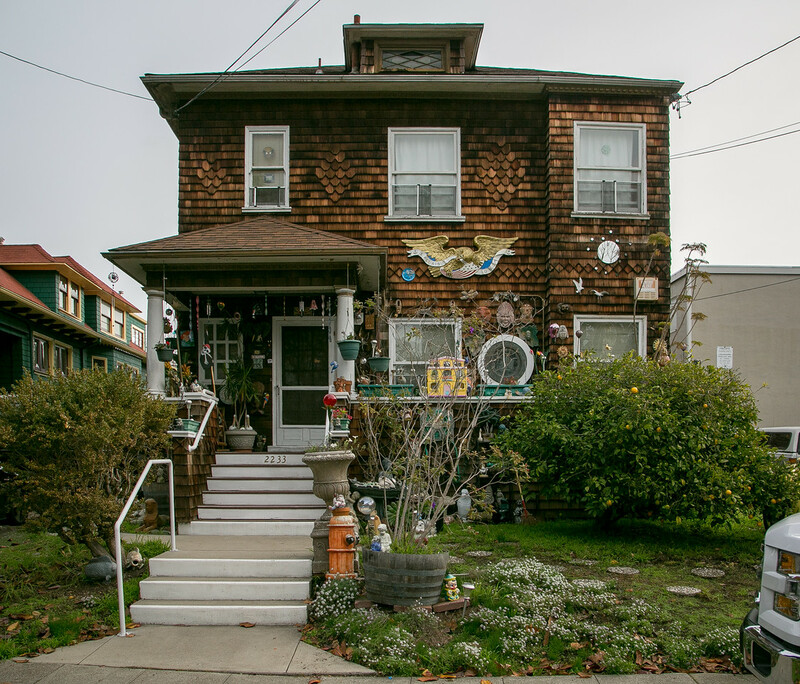 Mikee LaBash and Linda Mac live in this house on Curtis Street, which was the home of Frank Moore, a performance artist and shaman who lived with a severe case of cerebral palsy and who died in 2013. Cerebral palsy’s chains drove Moore to nearly pure freedom, to pursue what he called “nonrational, nonlogical, nonlinear magical knowledge.” He declined to be confined or defined. 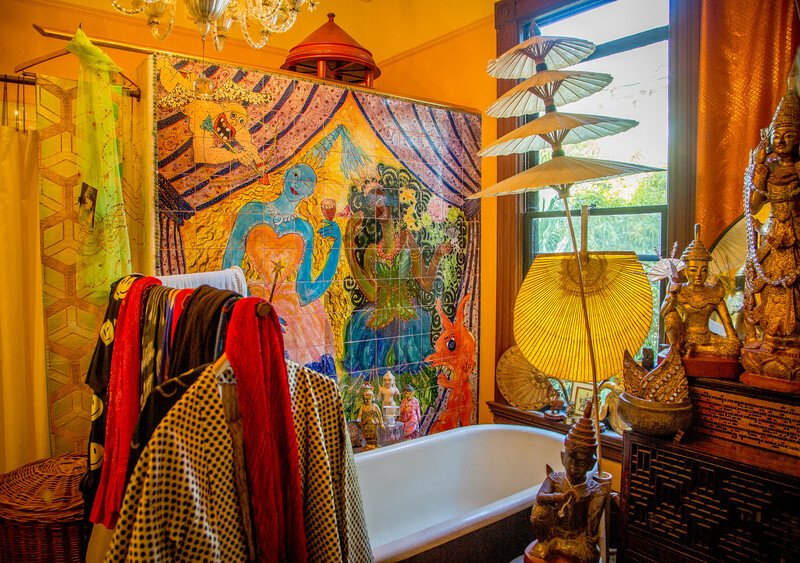 Inside the house, the walls are covered with paintings and drawings and photographs, evidence of Frank Moore’s vision and LaBash’s graphic genius. My post highlights what you can see from the street, the inside of the house, and the extraordinary life of Frank Moore. In this post, I aggregated photos of mermaids from throughout Berkeley. 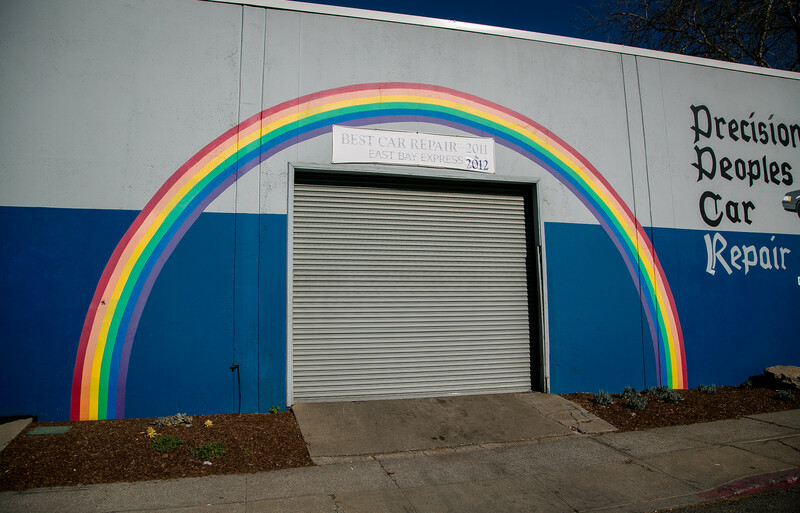 And in this post I aggregated photos of rainbows from throughout Berkeley. Boy – here I went breaking the rules again! 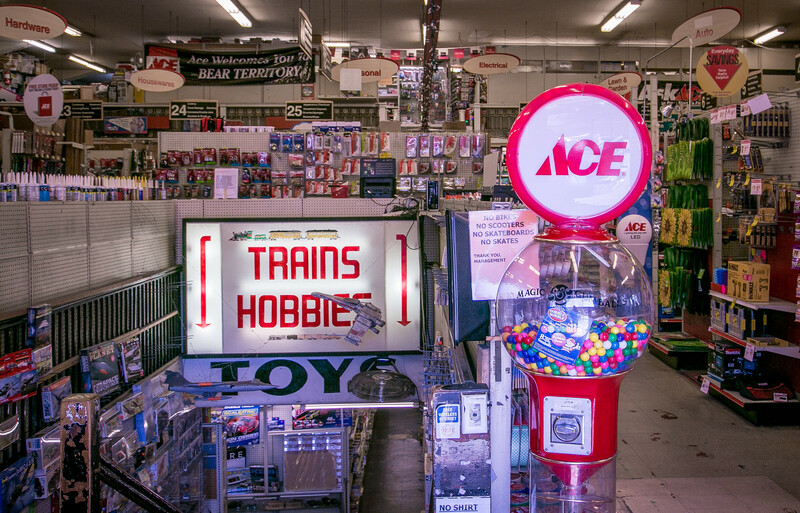 Just before Berkeley Ace Hardware shut the store on University and moved to Milvia, and posted on the great joy that the University Avenue location had given me – and Berkeley – over the years. When I posted this piece, there was a collection of post-it art visible from Milvia in the windows of the Tioga Building, Milvia and Addison. It met the rules. 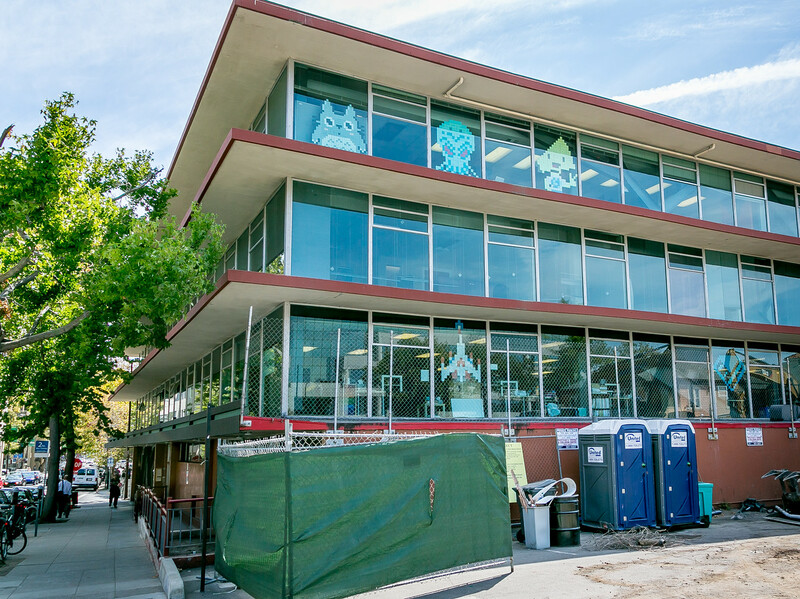 And then construction on the new Stonefire Building at University and Milvia obstructed the north-facing windows which house most, but not all, of the art. I was inspired by this visit. I’m starting to see a pattern. I broke the rules again! 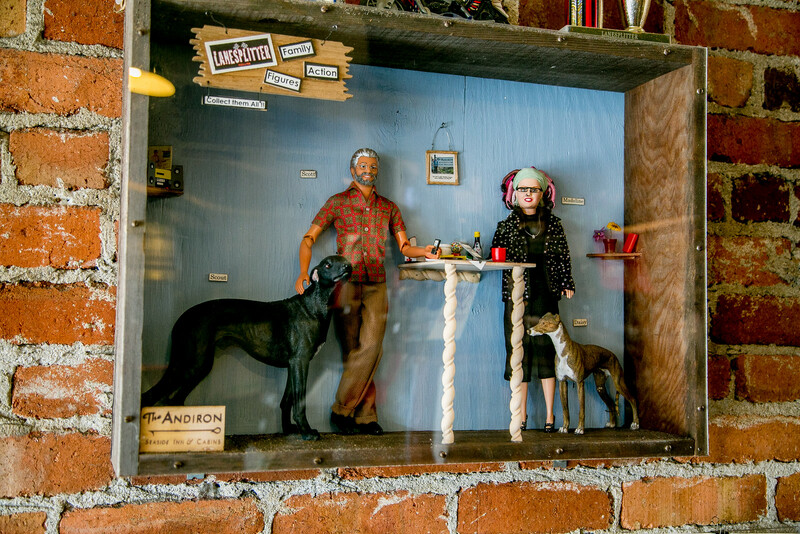 In this post I share photographs of action figure dioramas at Lanesplitter Pizza on San Pablo, and then digress into the uncanny valley and the quirky nature of dolls. 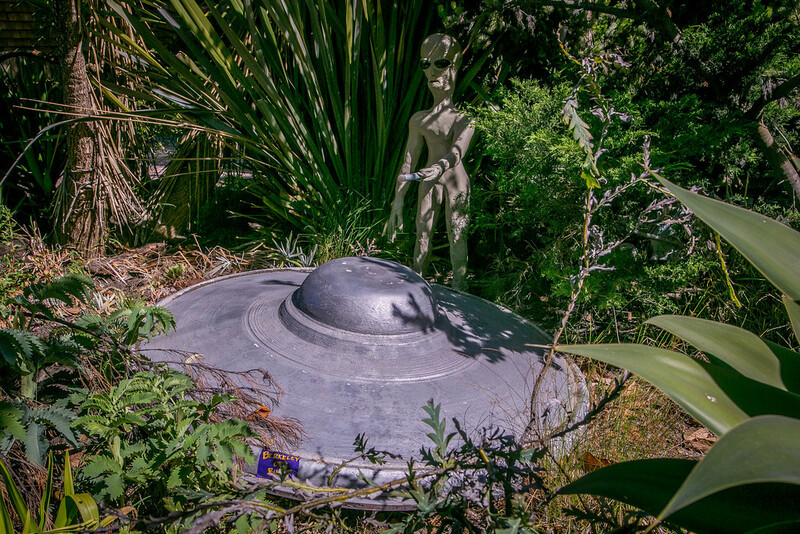 Half a block from the original Peet’s on Vine Street is this flying saucer and alien. 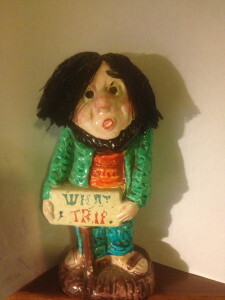 I posted on it, on George and Salska McNeil, and on the quirky art in and around their house. They are pure, the best of what is the Berkeley I love. I romanticize about having a simpler life. Bungalow courts exemplify this imagined simpler life. My post on bungalow courts – some but by no means all of the courts in Berkeley. Fox Court is as good as it gets. I could live there. Easily. Who wouldn’t? My post on Darwin the Retriever cat almost broke the internet. It was Very Popular. The internet loves cats. This cat retrieves and brings home scraps of paper, leaves, sandals – quirky material culture. Found magazine pounced – this is exactly what they look for. But usually not found by a cat. This cat is on a mission. For the mural lovers, I published a number of posts on murals – the murals of Kingman Hall, Berkeley murals before Stefen, the murals of Stefen, part one of the murals of Cloyne Court (first floor), new murals, the disappearing CIL mural, and murals that we lost in 2016. I have long considered Eni Green’s Harper Street dachshund sculptures to be a high-water mark in Berkeley quirk. I finally got around to the post that Green deserves, with an added look inside her house. 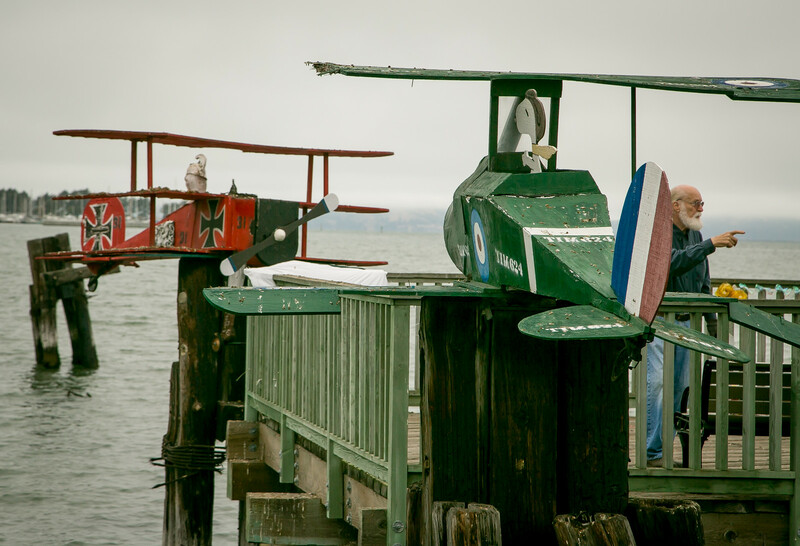 For 50 years, Tyler Hoare has been building and installing whimsical airplane and boat sculptures in the Bay – some of you will remember the earliest Snoopies in the mud flats of Emeryville in the 1970s as you drove by, maybe out with your family. In this post, I trace Hoare’s Snoopy and the Red Baron efforts as well as his sculpture and collage. Ken Shapiro owns and runs Precision Peoples Car Repair. Ken Shapiro builds and flies large remote control airplane models. 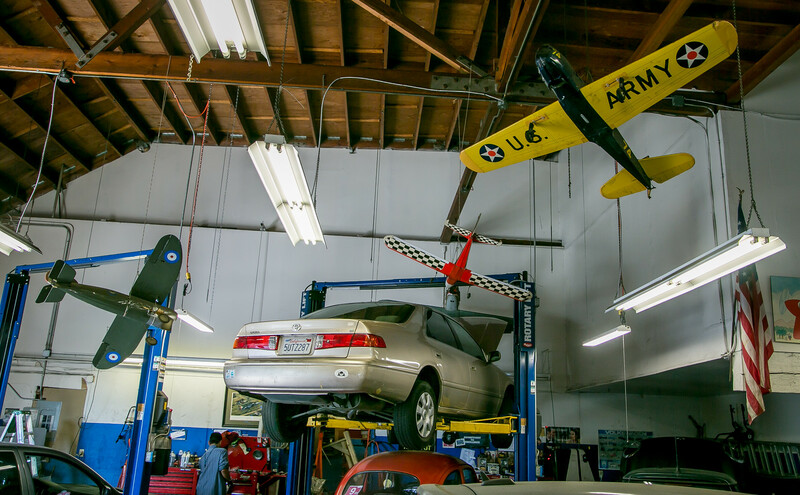 In this post, I show the intersection of the two – the garage on San Pablo filled with large model airplanes suspended from the ceiling. 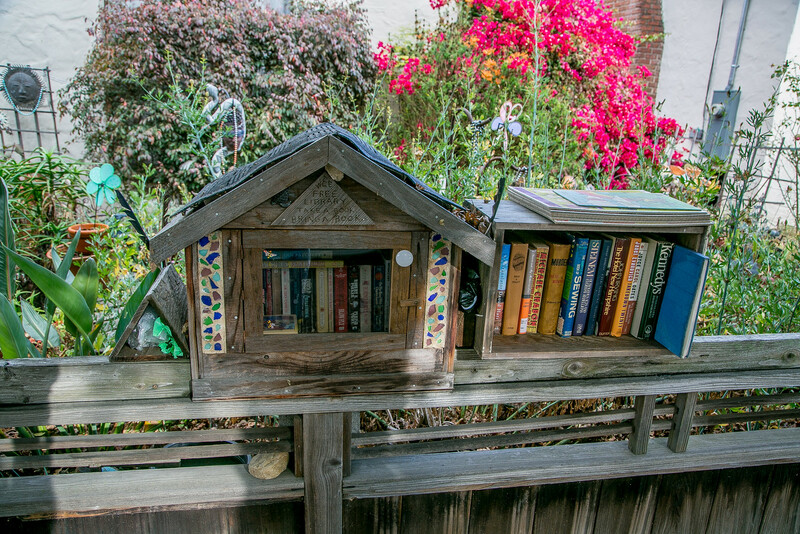 This post is an aggregation of what I call “rogue” little free libraries, free book exchanges without the official blessing of the Little Free Library organization. The bottom one is color and design-coordinated with the main house. I was excited to find it and show it off. I’m a sucker for small worlds, or at least what I call small worlds. It’s a small world after all! 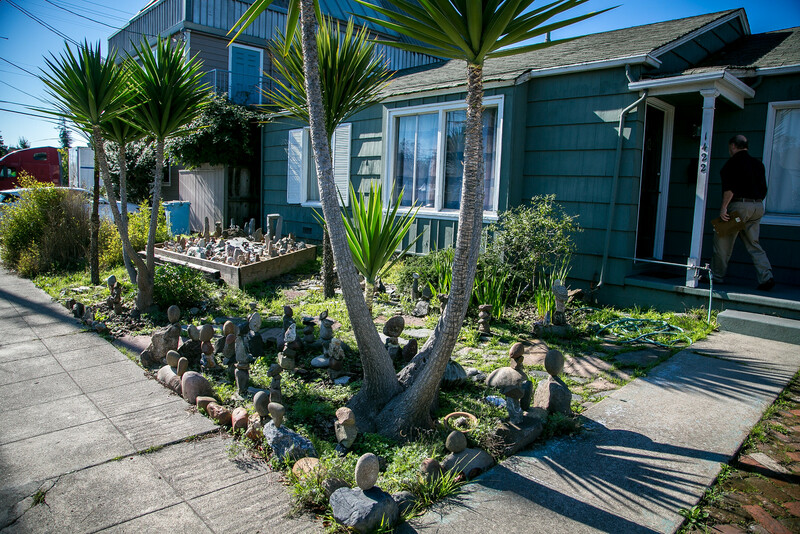 Mac McIlroy built this on 5th Street – a number of stacked rocks and a trapezoid-ish raised bed with rocks and little animals and trucks and – a small world. And – a lesson on the wisdom of the motto “Wise up or Shut up.” A cool post if I may say so myself. Thanks to Doug Heine for introducing me to Mac. I went and looked at it one night. The stacked rocks in the moonlight – wow! 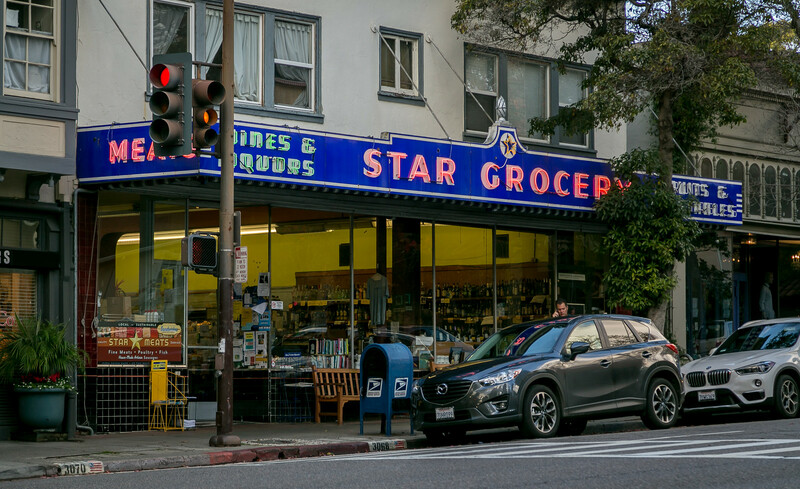 Mark Bulwinkle suggested this post – a store-by-store look at what Mark nominated and I confirmed as the quirkiest commercial block in Berkeley, anchored by Star Grocery on Claremont Avenue near the Uplands. In 2017, this may turn into a story of how good people who love Berkeley can work together to save the Berkeley they love. 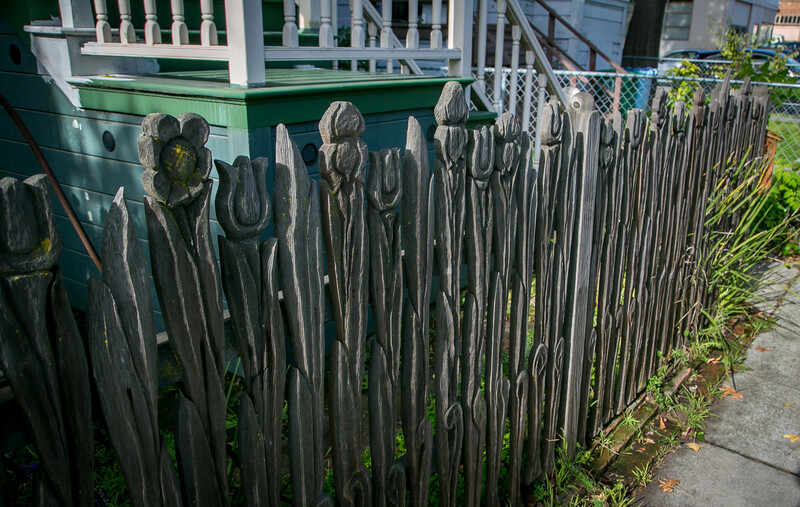 The second to last of the greatest hits of 2016 posts is my December post on Sheri Tharp and her carved redwood picket fence on Shattuck cross the street from Starry Plough and La Pena. 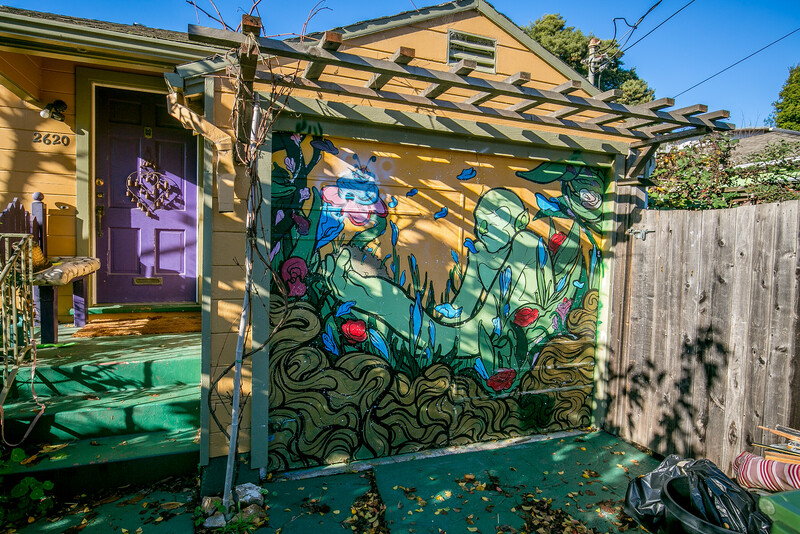 My final post of 2016 makes the greatest hits list – a post showcasing a collection of the best of Berkeley’s painted garage doors, plus a plea/suggestion for someone to commission a spray-paint, graffiti-style garage door. And then there were the holiday field trips – ten of them. What a fun idea that has been. What a year! Between my 50+ Quirky Berkeley posts and the 30+ Berkeleyside posts and the appearances I made and the walks I led, I felt like the Beach Boys were singing about me when they sang “I Get Around.” I’d get in line for high school enrollment for Charlotte or be shopping at (RIP) Andronico’s or walk into a store and a stranger would say, “I know you.” The love for our dear old Berkeley makes strangers into friends quickly, all lovers of Berkeley. Looking through what I did in 2016, I am impressed (with myself) (and Berkeley). And exhausted. A few hours each weekend, well-planned, and this is what you can do. Excuse me for a minute while I blush at all this. Not that I made any of the art, I just showed photos of it and talked about it. The artists and collectors are the heroes of this. Look at all of this! My friend scrolled through the draft post here. He too has noticed a change this year in Quirky Berkeley. 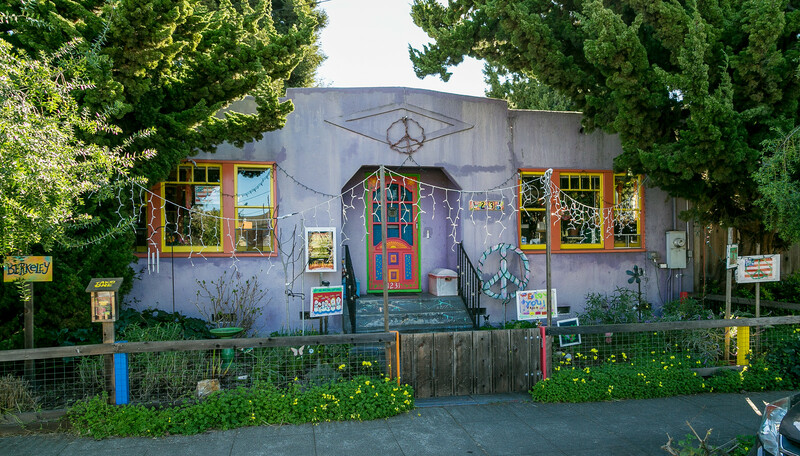 He sums it up – “Big Love.” Love of Berkeley, love of art, love of the human spirit that leads us to make a small world in our front yard or a carved redwood picket fence or doxie art or a big rainbow. It works for me – Big Love it is. But what about 2016? What about the best posts of 2016? Tom, Thanks for all you do, you have recognized the best in us and brought joy to the community. With the coming year we are going to need all the joy you can find.